As active stock investors, we look for companies that can potentially be worth more than what they are selling now. These can be companies that was doing well in the past, but currently not doing very well, but are showing some tell tale signs profitability may be returning. These could also be companies that have the hidden ability to do well and grow their profitability over long duration. The market might be underestimating their ability to grow their profits. How do we sense if the company is worth more than the price that it currently trades for? A company’s value is a summation of its stream of future cash flows. If we wish to determine roughly the value of the company then we need to appreciate its future cash flow. That often means, you need to appreciate the cash flow in the past. How do we make sense of the various cash flow of a stock? This will be what we explore today. Note: This article was first published 8 years ago in Jan 2010. It has been updated to be more comprehensive. When you decide whether to buy a business, you are looking at what is the nature of the business. You can listen to the company or financial analysts talk about the qualitative factors or the story of what the company do all day. The chart above shows an illustration of the cash flow of a company. The analysts reports the cash flows for year 6 and year 7 (we are currently in year 7). And then he forecast the cash flow for year 8 and year 9 to be higher. With only the data from year 6 – 9, the report give you a good idea that the company has great growth. However, if you peek into the cash flow in the past, it might plant doubts in your head whether that cash flow is consistent. You will start questioning what has changed. However, ultimately, the nature of the business can be seen by gaining an appreciation of its cash flows. You could argue until cow comes home how much of a competitive advantage you have to your prospective investors, but if your past 7 year of cash flows does not substantiate, then how do we know going forward it will be any different? By assessing the quality of the cash flow, it generates qualitative questions for you to investigate. The illustration above shows the past 15 years profile of a company’s cash flow. If we review the past cash flow, we would see that the cash flows were positive and remained profitable in the 3 years where the global economy is challenging. There are evidence that this business is recurring, and resilient. You will ask the question how come this company is able to do it so consistently? The cash flow shows some evidence of quality, and thus it may pay for you to investigate further. In another example, the share price have been observed to be in the doldrums for sometime. An investigation of its past cash flow shows that it tends to be recurring and growing. However something happened in year 11 that caused a sharp cash flow dropped and didn’t recover for 3 years. 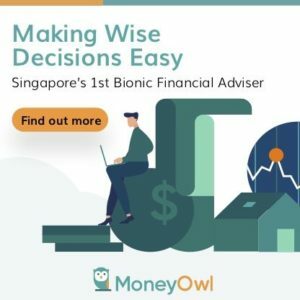 Recently, there was an announcement of some strategic shift to get out of certain non performing markets that the company have been dedicating resources to. You observe in the last three quarter the cash flows seem to be turning. Such a review of a longer history of its historical cash flow gives you an idea that there might be a story to this company. One of the top aspect of active investing is to respect valuation. This means you need to be rather clear if this company is leaning closer to fair, overvalue or undervalue. To do that we use various valuation metrics. In these three commonly used valuation metrics, notice that you will need Net Profit, EBITDA, Free Cash Flow or some cash flow inputs. The ability to figure out these cash flows is important to start valuing the business. The quality of these cash flows affects the quality of your analysis. Reviewing a series of cash flow can explain a lot of things. I mentioned previously that valuation requires the cash flow input. So what do you use for the E in PE, EBITDA in EV/EBITDA? A lot of people like to use the preceding earnings and EBITDA from the previous year. Analysts also often put the preceding year’s financial figures in their reports as well. This is what we term the historical value. Then they applied an estimated growth to compute the future or forecast value. The danger here is that perhaps the very last year, this company you are analyzing is in a particular year where its cash flow is at the best or worst. If you use this particular cash flow only in your valuation models, you will come to a conclusion that the company is unbelievably cheap or worth it or very expensive. Imagine you decide to value a company with its earnings or EBITDA of the immediate past year of $5000, without looking at its longer history. You might think get the impression this company is too cheap because the cash flow is too good. The historical cash flow might tell a different story. 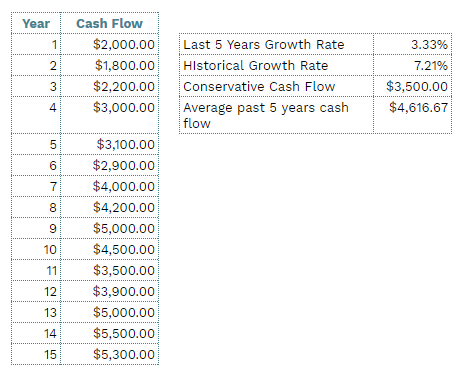 This cash flow history might be available or might not be available to you. If you see the cash flow as above, you might tamper with your expectations on last year results repeating. My suggestion is that you review 5-15 years of its historical cash flow. Reviewing a series of cash flow will tell you a story. Chances are 15 years is a long time where there were many challenges, recession and booms that you can find out how the company did during various scenario. You can then use a conservative cash flow, average cash flow and optimistic cash flow to see if currently the company is cheap, fair or expensive. Reviewing a series of cash flow is most important if you are using discounted Cash flow to work out the intrinsic value of the company. What is the initial cash flow to put into the DCF? What is the right growth rate to use? By looking at 5-15 years of data, you have an idea what are the growth rates like for this industry in the past. Reviewing a series of cash flow normalize your expectations of what analysts and news said about how wonderful, poor these business are. That is a long one. And I will probably explain in a later section why I favor this over other forms of cash flow. When you are reading this article, do bear in mind not to look for the holy grail of that single cash flow that will rule them all. Each cash flow has its own short comings and some of them have their own strengths. Dividend payout is a cash outflow from the company. This is a cash flow most investors are interested in because it is partly your payment for investing in the company. The other payment are the capital gains when you sell off your stock. One of the reasons why you would wish to analyst a company cash flow is because you wish to find out if the current, or historical level of dividend payout by this company is sustainable. A sustainable dividend is one where the dividend is less than the cash flow. If the dividend is not sustainable, eventually the company might cut the dividend, which sense a signal to the market that future returns is lesser, the company stock is valued less and will result in share price to fall. In the annual report, or quarterly financial statements, there are 2 areas where you can see how much dividends are paid out by the company. The most common metric that you will come across to know whether a company is doing well or not is the net profit. You invest your cash in the company, the company goes out to buy assets that produce revenue after cost. The end result is that you get a profit. The net profit tells you, for that given year how much the business earns, after costs, for the goods delivered or services rendered for the financial year. Interest Income (+). Similar to #5, The company holds cash and they earn interest on those cash. For some with a large cash holding, this can be significant. Net profit is commonly used. You can compare the net profit over different years to see the trend of the net profit. Is it always fluctuating around a similar band, is it increasing, is it decreasing, or is the net profit volatile. If you divide net profit by the market capitalization of the stock, you get the earnings yield. You can then measure against other potential stocks you are looking to invest. The higher the earnings yield the better. Net Profit is often used because it is an accrual accounting statement that is mandatory in quarterly and annual financial reports. For this illustrations, we will use Frasers Centerpoint Limited (FCL)‘s 2017 Annual Report. FCL is a conglomerate property developer and property owner. It owns a set of properties, and subsidiaries involved in development or holding properties that are leased out for rental income. It also own associate REITs that it own shares in but do not control more than 51% of the number of outstanding shares for those REITs. 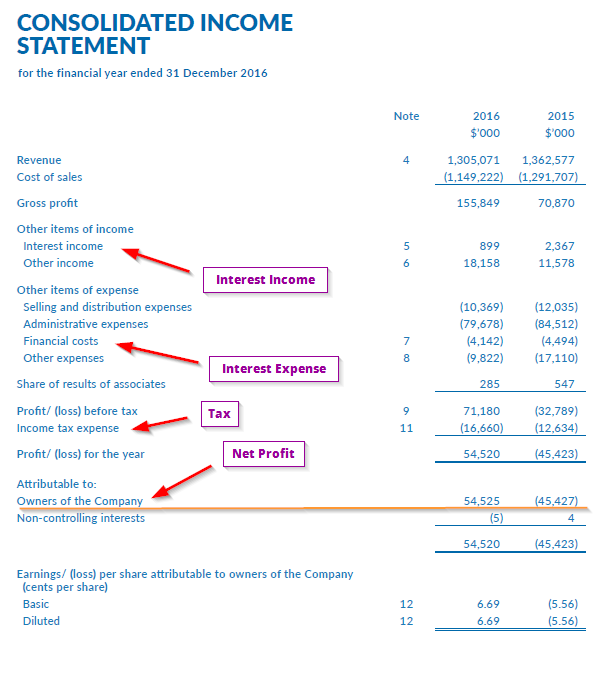 FCL’s income statement is fairly complex and perhaps a good illustration of possible deficiencies if you are relying on the net profit to ascertain whether the company can support the cash flow for dividends. FCL in these few years pays out a consistent $0.086 in dividend per share. Based on the number of outstanding share of 2910 mil shares, FCL would need $250 mil in cash flow to safely pay for their dividend. 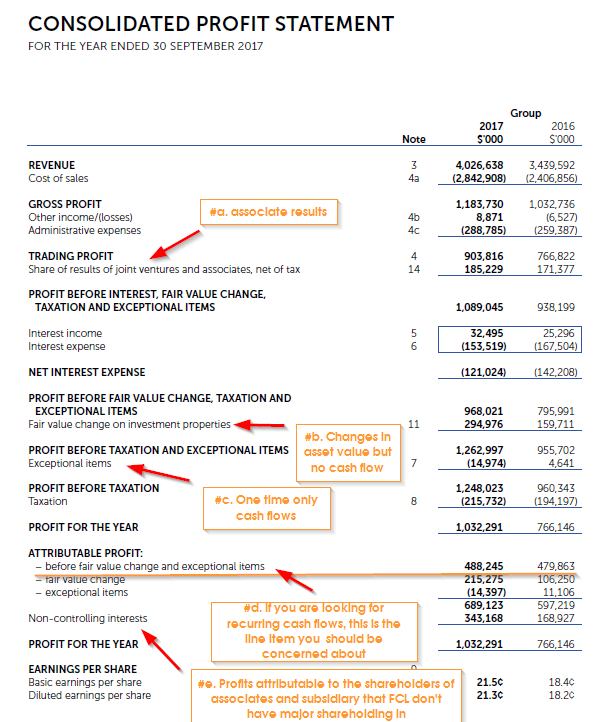 You can find the net profit/income statement in the annual report. It will look something like the above. A lot of you may conclude that the profit for the year of 1032 mil in 2017 and 766 mil in 2016 is the profit that FCL earns. This is true, but that may not be the cash flows that FCL enjoys that it can pay out dividends, retain, pay down debts. #b. shows the fair value change on investment properties. This shows a profit of 294 mil in 2017 and 159 mil in 2016 as a result of their properties being valued higher. However, that is not actual cash flow but just accounts that their assets have the propensity to sell for more gains if they choose to. So this should be taken out. #d. FCL is good that it breaks down nicely the profit before fair value change and exceptional items as $488 mil and $479 mil. If we were to zoom in on a usable number, this is the closest that we can get. However, do note: FCL is both a developer and a landlord. The development part is less recurring and more volatile, while the landlord portion is more stable. So if you are looking at the conservative cash flow estimate, you may need to find out the percentage of income composition of developer versus landlord. #a. This give us a glimpse of the contribution from FCL’s joint ventures and associates. These are likely to be holdings that are less than 51%, where the entire profits of the subsidiary are not recorded as FCL’s profits. The figures ($185 mil, $171 mil) shows it can be quite sizable as compared to the cash flow required for dividends ($250 mil). However, also note that this is the profits in JV and associates, could contain non-recurring cash flows as well. As a summary, not all companies’ consolidated profit statement is as complex as FCL. They can be quite straight forward that the net profit is almost like the cash flow. FCL is an example to illustrate that sometimes, we need something more than net profit. 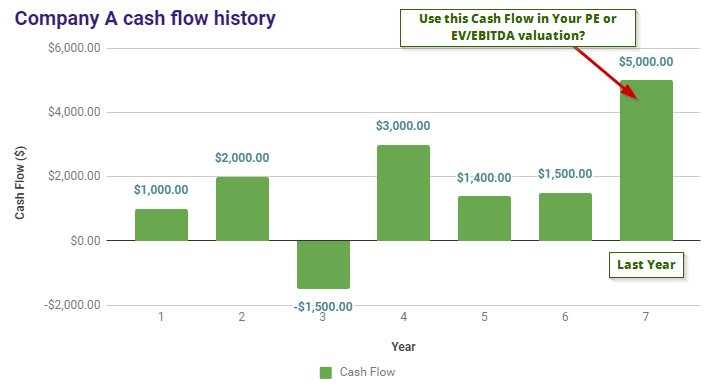 EBITDA, is what I would term pure cash flow. It adds back the depreciation & amortization, the interest expense paid out, and interest income received and the tax paid out. Depreciation and amortization are non cash expenses. So they are basically accounting or what is recorded on the accounting books to reflect the changes due to service and goods rendered in the work year. No cash flow is going out. By adding this back in, it gives us an idea the size of the cash coming into the business. Depreciation and amortization can be huge. For utilities company, or trusts such as Sembcorp industries, or Keppel Infrastructure Trust (KIT), the net profit can be losing money or barely breaking even. However, when we add in the non cash depreciation and amortization expense, you realize there is alot of money to pay dividend, reinvest, pay down debt. Interest expense and income are taken out. Interest expense and income is a matter of how much debt and cash the company take on. Of course having low cash and high debt means the company have more cash flow generating assets. EBITDA takes this out to see the purest form of cash flow generated by the entity. Tax expense are taken out. Tax is a matter of the operating environment or the tax regime in the area of operation for the company. It is important, but in this case, we wish to see on a neutral basis, the cash flow generating abilities of the business, or assets. The performance of how the business perform should be evaluated without considering the tax aspect. We will learn how to compute the EBITDA by using HI-P 2016 Financial Statement as an example. HI-P is an integrated contract manufacturing firm home based in Singapore. It operates 14 manufacturing plants globally. The nature of the business is that revenue can be cyclical and there are much operating leverage in the business. As we learn in the net profit example, we need to consider whether there are profit attributable to minority interest to worry about. 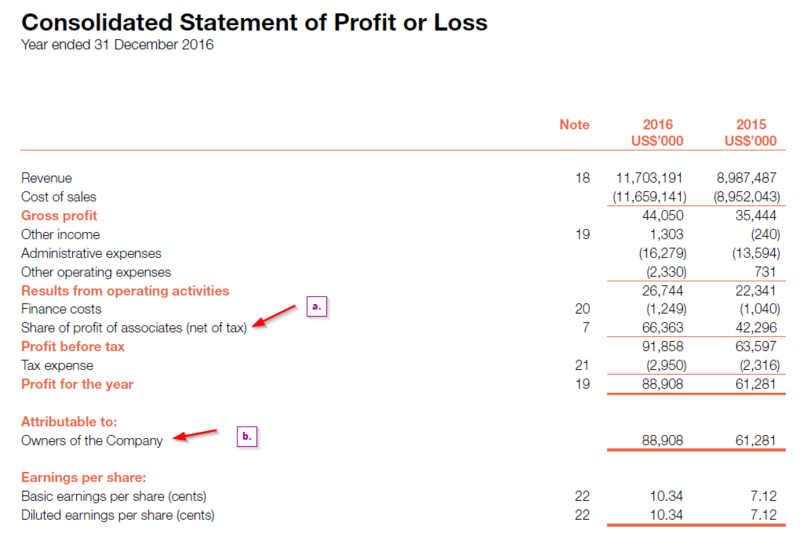 Hi-P’s income statement is much more clean (why sometimes smaller company is easier to figure out). We can get the net profit, tax, interest expense and interest income from here. This is just the net cash flow from operating activities. There is still the net cash flows from financing and investing activities that I did not append because they are less relevant here for EBITDA. As you can see I underlined the depreciation and amortization. 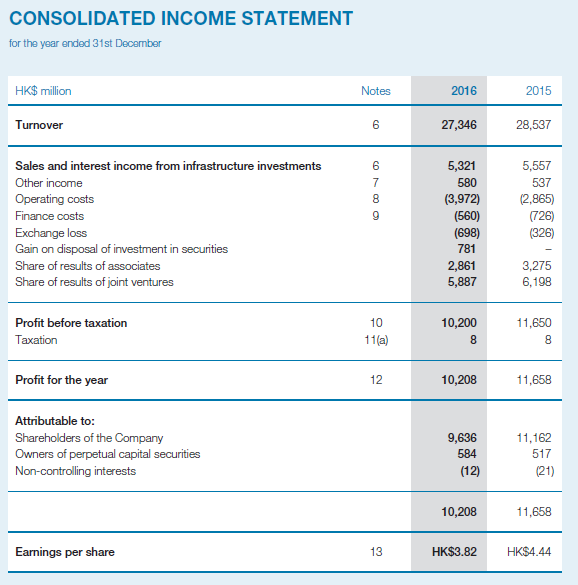 In 2015 the net profit for HI-P was negative, but in actual fact the cash flow was positive. In 2016, there was a tremendous growth in EBITDA. The main advantage of EBITDA is that it is easy to generate. Compare to other formulas, it leaves little to imagination. What you see is what you get. The private equity firms like to use EBITDA. They use this cash flow to justify how many times of EBITDA they are willing to buy the company for. Typically, they would try to purchase the entity at 10-11 times EBITDA and then try to optimize it (leverage, cut cost etc) so that the cash flow looks much better. The share price should rise accordingly. Warren Buffett does not favor using EBITDA. Flaw 1: Does not give enough respect to maintenance capital expenditure. Without taking into consideration the maintenance of its tangible and intangible assets, what you are purchasing is an entity that have a limited lifespan. This means that if you use EBITDA in your valuations, you have to be aware to look at it this way and not as a perpetual lifespan assets. Thus, a business can have very good EBITDA but poor EBIT, free cash flow after accounting for the maintenance requirement. Flaw 2: EBITDA does not take into the non cash working capital or non cash earnings and losses. Some companies can have wild swings in their inventory, receivables and payable level. This can be due to the nature of the business, due to poor management, or deliberate decision to borrow with payable instead of using traditional debt. If you have more payable as a deliberate decision, the company might seem to be bringing more cash flow from its main operating segment then another similar business. Having more receivables and inventory than last year, gives the feeling that, based on EBITDA there are a lot of cash flow, but in actual, the cash flow is less. Flaw 3: Does not account for dividends to minority shareholders, preference shares, perpetual securities. The company may have other cash outflows that result in less cash that equity investors can get access to. In one case, the company is a conglomerate and owns only part of the subsidiary. They still have to pay out dividends to minority shareholders that are not equity holders of the company. These dividends to minority shareholders are not factored in (meaning deducted). For preference shares and perpetual securities, these are a hybrid of stocks/bonds that are issued to another group of people. If dividend is declared for the company, they have to pay a separate dividend to these preference shareholders and security holders. These dividends are not factored in (meaning deducted. This brings us to the next kind of cash flow which is the operating cash flow. Cash flow from operating activities (CFO) is an accounting item that indicates the amount of money a company brings in from ongoing, regular revenue generating business activities, such as manufacturing and selling goods or providing a service. Cash flow from operating activities does not include long-term capital or investment costs. To get the cash flow from operating activities is easy, because in most company’s financial statements, under cash flow statement, the net cash from operating activities are consolidated nicely for you. To get the operating cash flow, we can easily get it from the statement of cash flows. We will use China Aviation Oil (CAO) to illustrate. CAO supplies jet fuel and trade jet fuel for over 17 international airports across mainland China, trading of other oil products and investments in other oil related assets. Its claimed of fame was when the firm ventured into speculative trading of oil prices that left it on the brink of not being able to continue to run. Today it is a much different story. There is nothing that we will pick up here. 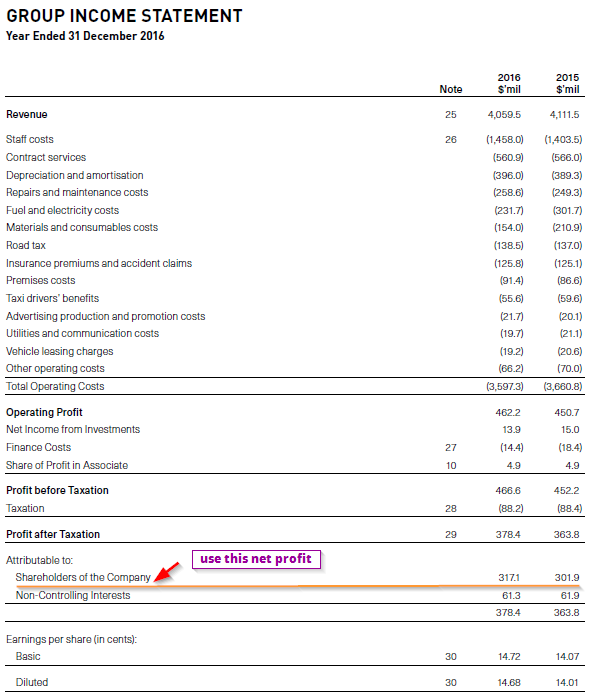 However note that in #b, the net profit looks splendid. Also note that #a, the share of profit of associates net of tax, is almost as big as the net profit. I may not have explained but the statement of cash flow basically adjust the income computed from the statement of income, removing and adding the non-cash and cash stuff to arrive at whether there is an increase or decrease in cash. #a. shows you the operating cash flow that we are interested in. It is as easy as net profit and relatively EBITDA. From this we see that in 2016, CAO operating cash flow is -0.5 mil. In 2015, CAO operating cash flow is 53.9 mil. Then it adjusts for working capital. And for a business that keeps inventory, and works with receivables and finance by payable, we will observe year to year fluctuation from working capital. In 2015, if you sum up the change in inventory, receivables and payable it is -121 mil. This means there is a net outflow of 121 mil purely due to working capital. In 2016 this is -37 mil. The change in working capital will depend on the business nature. Some businesses like CAO have working capital as a normal feature of the business, while REITs most often do not have. #d will be totally missed out from operating cash flow. To be fair not every company will have so many associates but I can think of a few that have such as SIA Engineering in Singapore, Cheung Kong Infrastructure in HK. 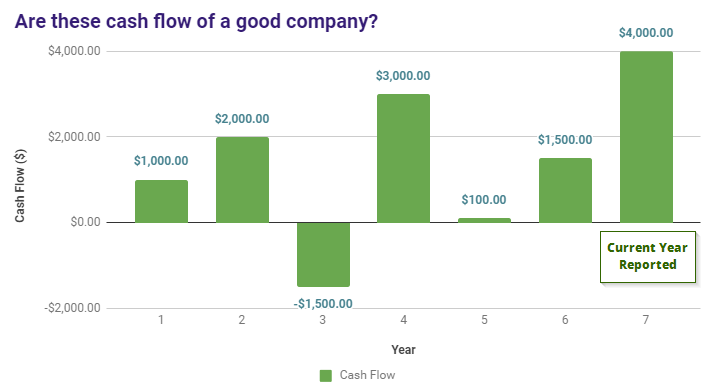 Operating cash flow is pretty good in that it sums up the actual cash flow that flows in or out of the company that is directly due to revenue generating businesses. It adjusts for depreciation and amortization. It adjusts for the non-cash exceptional income, losses. It adjusts for the non-revenue generating joint ventures and associates by removing non-cash earnings from them. It adjusts for the non-cash working capital changes. There are some flaws if you use operating cash flow. Flaw 1: Working Capital Changes can be volatile. For some business, which are working capital intensive, you will see the operating cash flow go positive one year, negative another year. The result is very volatile because there are swings in working capital. For business reasons, the business might stock up on inventories. So given this situation, how do you find a useful baseline cash flow for this business? It can be a struggle. Flaw 2: Does not account for Dividends from Joint Ventures and Associates. Operating cash flow does a good job adjusting by taking out the earnings from joint ventures and associates that are not revenue generating. Some business have JV and associates that have earnings accounted under profit but in actual fact the profit cannot be taped since they belong in the JV or associates. The payment of this dividends from joint ventures and associates are recorded n the Net Cash from Investing Activities section. However, these dividend cash flow can be significant cash flow that as a business owner you should consider. Flaw 3: Does not account for Interest received and paid out. 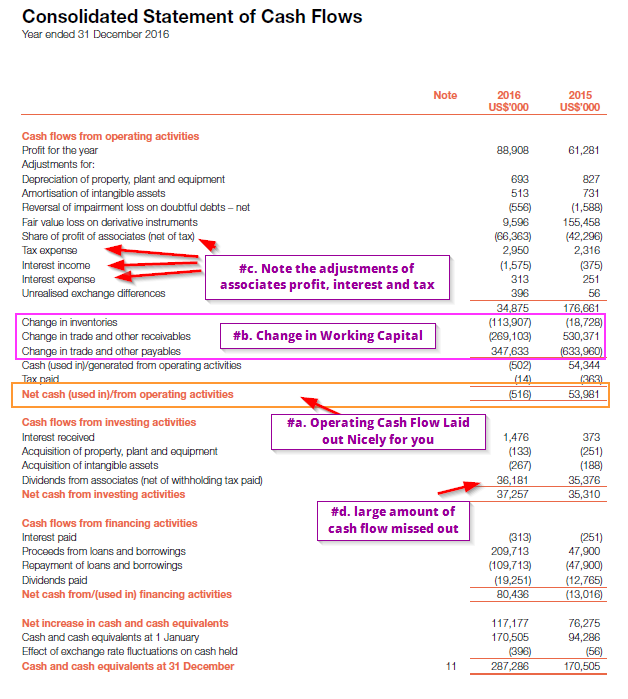 Interest income and expenses are removed from operating cash flow. Interest Received are recorded in Net Cash from Investing Activities, while Interest Paid Out are usually recorded in Net Cash from Financing Activities. As a business owner concerned about being over-leverage, or ability to cover dividends, you need to consider interest paid out. For some Hong Kong based companies, their cash are so significant that the interest can just pay the dividends! Flaw 4: Does not account for dividends to minority shareholders, preference shares, perpetual securities. The company may have other cash outflows that result in less cash that equity investors can get access to. Free cash flow or owners earnings is the holy grail of cash flow. And it tends to be the one that Warren Buffett use. I think you will prefer the short version. In actual fact don’t be surprised that there are a few versions due to different account standards in the world. However, the general idea is that you take net profit, add depreciation, add one time changes losses/profits, add working capital changes and deduct capital expenditures. The difference is whether it factors in interest or not. We will compute free cash flow with the example of ComfortDelgro. ComfortDelgro is a Singapore listed transportation company that operates bus contracts, taxis, car leasing, engineering, inspection and driving centers in Singapore, Australia, UK, China, Malaysia and Vietnam. This is where we will get the net profit of 317 mil and 302 mil, which are attributable to the company. We need to factor in a,b,c,d into our net profit. The change in working capital is -23.6 mil in 2015 and 8.5 mil in 2016, which are rather small changes. As you will see later, most businesses declare their capital expenditure such as purchases of vehicles, premises and equipment. You have no idea if ComfortDelgro is committing to purchase investments for growth or to keep steady. For b, this seem to be a government grant that really boosted ComfortDelgro’s results. Is this a one time cash flow? I am not sure. But if I review as far back as 2009, 2014 annual reports, I do not see this figure around. Perhaps it is safe to consider this as one time only, and should be deducted. Thus for 2015 the levered free cash flow = 301.9 mil (profit) + 389.3 (depreciation) – 130.8 (one time adjustment) -23.6 (change in working capital) – 387.7 (total capital expenditure) = 149.1 mil. For 2016 the levered free cash flow = 317.1 mil (profit) + 396 (depreciation) – 104 (one time adjustment) + 8.5 (change in working capital) – 388.3 (total capital expenditure) = 229.3 mil. Could these free cash flow safely accommodate ComfortDelgro’s dividend? A review of the financing section shows that in 2015 the company is paying out more than its free cash flow. Whether this is irresponsible or not, we have to assess it over a period of time. The company might be very confident about its cash flow that the cash flow should recover in the next year. We can now compute the unlevered cash flow on ComfortDelgro and see how different of a figure we get. In 2015 the cash flow from operations is 600 mil while in 2016 it is 702 mil. Let us use the same capital expenditures. As we can see, the figure differs a little bit. The difference can be the miscellaneous non cash one time adjustments that processes profit before taxation to arrive at cash flow before working capital changes. The difference between owners earnings / free cash flow and net profits. The main difference is that net profit is accrual accounting and may contain non cash flow income or expenses. Free cash flow will add in the exceptional non cash expenses back in and deduct the exceptional non cash income from the final value. What you get is closer to the recurring cash flow you need. All things being equal, the company’s depreciation and amortization should equal, the maintenance capital expenditure. Thus the net profit should be close to free cash flow. However, some business, their plants and machinery cost more or less than in the past to replace. Thus free cash flow will be different. There are exceptional business that they don’t need to add more capital expenditure to maintain the profitability. These are rare and what we call businesses with strong economic moat. The last big difference is that working capital changes might cause drastic difference between net profit and free cash flow. Some business have very volatile working capital (change in receivables, payables and inventory). One year the free cash flow can be negative, another year very positive. What you get is really the cash flow that you can pay out as dividends, reinvest into the company, pay down debts, buy back shares, retained in the company. The unlevered free cash flow does not factor in deducting away the interest expense and adds the interest income. Other than that its pretty good for the dividend investor to find out how much cash flow they can use. There are 3 problems with the free cash flow. Flaw 1. Working Capital Changes can be volatile. For some business, which are working capital intensive, you will see the operating cash flow go positive one year, negative another year. The result is very volatile because there are swings in working capital. For business reasons, the business might stock up on inventories. Flaw 2. Maintenance Capital Expenditure is Hard to Break out from Total Capital Expenditure. The main issue with getting the free cash flow is how do you determine what is maintenance capital expenditure. Yes, we can get the capital expenditure from the Net Cash from Investing Activities. However, it can be very noisy. You will see new acquisitions in plant, property and equipment, or investments. How do you know whether those are for expansion or just for maintenance? In a lot of instance, you will need to ask the management. Investor’s Cash Flow is the arbitrary name not found anywhere that I have given to this kind of cash flow. It is a custom cash flow. The Investor’s cash flow comes from the angle of the equity investor and its evaluating for his benefit. Thus it is also a leveraged cash flow. It factors in a lot of the cash flow that will receive and a lot of the cash flow that will be paid out. I will illustrate this using Hong Kong listed Cheung Kong Infrastructure (CKI) (1038 HK). CKI is listed in HKSE, and its indirectly owned by Cheung Kong Holdings, the parent company of Li Kar Shing. It owns a set of infrastructure and energy assets. The unique thing about CKI that is applicable to illustrate Investor’s Cash Flow is because it runs a revenue generating operating business, but a large part of its business are held in associates that CKI owns not more than 51% ownership. Thus, a part of its cash flow will come from dividends from associates. Also, as of 2016, it is finance by equity, debt and perpetual securities. In the profit attributable we can see that there are a fixed amount of 584 and 517 mil attributable to perpetual security holders. Then there are the amount to the minority shareholders. CKI’s net profit fell from 11.1 bil to 9.6 bil. 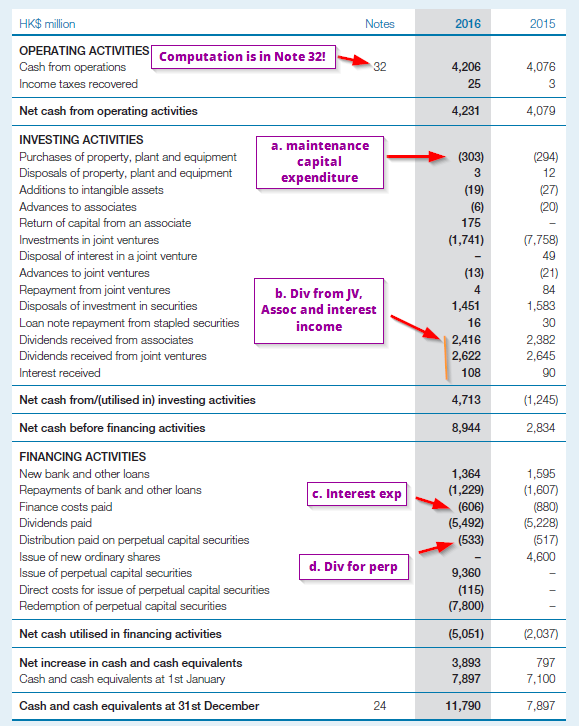 You will notice that, unlike Singapore’s cash flow statement, the net cash from operating activities are rather short. The details are summarized in Note 32. Just like the Singapore operating cash flow statement, it starts off with profit before taxes and adjusts for the non cash items, non revenue generating cash flow items, and one time cash flow items. What we need here to compute the investor’s cash flow is e. operating cash flow before working capital. This is the figure after all these adjustment but before working capital and taxes. 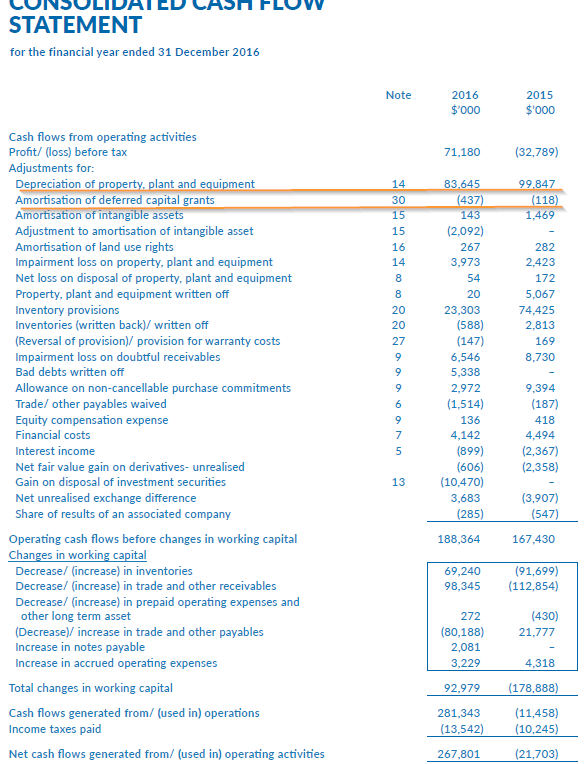 Also note that in the investing section of the cash flow statement, the maintenance capital expenditure is low. This is because most of the capital expenditure takes place at the associate level. While the debt to asset in CKI is very manageable, its associates Power Assets holdings is cash rich, but its other utility companies can have debt to asset ratio of higher than 50%. The capital expenditure in CKI’s case is therefore the investment in joint ventures (7.7 bil in 2015 and 1.7 bil in 2016). The investor’s cash flow is lower than the net profit, due to a difference in profits from JV in the income statement versus the dividends from JV in the cash flow statement. They can handily cover the 5.2 and 5.4 bil in dividends paid out. All cash flows have their own weaknesses and Investor’s Cash Flow will have its weakness. The main weakness is its omission of changes in working capital. The reason you could achieve consistency in identifying a recurring cash flow that you can use to evaluate the company is by taking out flows of short term changes to inventory, receivables and payable. However, this does not mean you turn a blind eye to working capital. These could be real outflows from the company that slowly manifest to become a real problem. The way to tackle this is to evaluate the quality of change in working capital together with the Investor’s Cash Flow. We tally a 10-15 year of net change in working capital. Working capital should be short term flows and if we have one year of negative net change in working capital, the next year it should be balanced back. Thus if we look at an aggregate of 10 years of change in working capital it should be close to 0. In this case there is no deeper problems with the business based on this. However, if we consistently see the net change in working capital to be significantly negative it may mean that the company have a lot of sales, but not collecting it overtime in cash, or keeping a lot of inventory stock but not selling well over time. It tells us the nature of the business or in a business that tends not to have this problem, the performance of the management. A significantly positive net working capital may mean a much higher payable. Perhaps instead of taking longer term loans a lot of the business are finance through these means. The cash flow of this company might thus still be very leveraged. In 2015 the change is -0.784 bil while in 2016 the change is 0.589 bil. In the grand scheme of things, these 2 sums are relatively small versus the eventual investor’s cash flow of 7-8 bil. They also cancel each other out, with one being positive and the other being negative. We do not see evidence of deeper cash flow concerns for CKI here. I have gone through the various types of cash flow, and you can re-read them again when you go through your company’s quarterly and annual financial statements. However, there are always more questions on cash flow because you cannot standardize everything. How do we get Maintenance Capital Expenditure? One of the main problems have been to identify how much is the amount required to maintain the business. In most cases, the purchase of plant, property and equipment will just give a number. This can be all for maintenance, a mixture or all for expansion. In some business nature, the company needs to acquire new assets as a form of maintenance. Thus what this means is that what is required to maintain the business will differ from business to business. The best way to find this out…. is to ask the management out of the total spending, what are they spending on. Is all these required to upkeep the business. Also, what other investments are required so that the business can maintain its competitive edge. There are 2 other ways that people can estimate. The first way: capital expenditure usually is a function of the level of revenue in percentage. If you review 10 years of revenue and capital expenditure, you might be able to find out whether there is a uniform change in capital expenditure due to the increase in revenue. You might be able to work it out. The second way: take a look at those periods where operation wise, the business is in a challenging situation. If a company is in recession, they might bunker down and go into siege mode, and control their spending so that its only for maintenance purpose. You may get an idea how much is the maintenance capital expenditure. Should you use the taxation and interest figures in the income statement or cash flow statement? In most situations, I would use the figures in the cash flow statement. This is because based on accrual accounting, the income statement would record down the taxes and interest payable due to the goods and services rendered for that year. However, in actual situation, the taxes paid out and interest paid out might be lower. Some of the taxes might be deferred or some tax credits can be used. Thus, if I am looking at how much cash is actually coming in and out on a recurring basis, I tend to use the figures in the cash flow statement. For REITs and Business Trusts, how differently should we look at these Cash Flows? REITs is a sector of business that is in the business of buy and hold property. Business trusts are a niche group of business whose assets tends to provide cash flows. With that in mind, REITs and business trusts will have similar cash flows to your regular businesses. For REITs, they have their own cash flow terms such as Funds From Operations (FFO) and Adjusted Funds From Operations (AFFO). These two are equivalent to Operating Cash Flow and Free Cash Flow respectively. Their cash flow tend to be very recurring but they also pay out almost all their cash flows as dividends locally. Thus they do not retain for growth, and the way to grow is via debt and new equity/share issues. Business trusts can be recurring but can also have volatile cash flows because some trusts invest in “exotic” assets that sometimes masquerade as very recurring but may have some shocks investors are not aware of, such as bad weather affecting cash flow, niche demand affecting business. What if the company have Volatile Cash Flows? In one of the examples earlier, I pointed out that the cash flow might be volatile. Technically speaking these business can still be evaluated from cash flow basis. What it means is that you have to abolish the idea that their cash flow in the past and focus on estimating their cash flow going forward based on the amount of assets and business they have. Business that have volatile cash flows tend to be order book based business, or business whose demand and supply tends to be volatile. For example, a property developer’s earnings tend to be volatile, depending on how many projects they complete in the year. You can estimate the level of cash flow based on the amount of land bank they have, the land cost, the construction cost, and the margins based on market conditions. This gives an idea potentially how much cash flow that might be realized by the company and how the discount of this cash flow measure s up to the current market capitalization. In general, when the cash flow is volatile, the company tend to trade at a lower band of PE. This is because low PE means to get back your capital, it only takes a short number of years. However, it is also true that because business can be cyclical, or uncertain, you cannot project the cash flow earn further than short years. Thus even if the price earning is low, it may not mean the company is cheap. What are signs of Healthy and Unhealthy Cash Flows? Different companies have different capital management structure based on the stage of growth and the nature of the business. Some companies start of doing pretty well, then they start going down hill. Some companies start off selling you a good story but when you look at the financials, you have more questions than praise. 1. Dividend payouts, Repayment of debts, Buy Back of shares should be less than Free Cash Flow or Investor’s Cash Flow. These 3 are healthy business decisions that rewards the share holders. While we expect that in some years dividend payout is larger than the cash inflow from business, they should largely be inline. This is one of the reasons we placed so much emphasis on cash flow to ascertain that over a long period, whether these actions taken by management is sustainable. 2. Net Changes in Working Capital should be Low. There can be one or two years where inventories and receivables built up. Balancing these with payables is good. But when payables are consistently high compare to receivables and inventories, you have got to dig further why it is like this. 3. Company should be conservative in paying out of depreciation. Depreciation should be matched by Maintenance Capital Expenditure. Properties and plants will eventually wear and tear and need replacements, and concessions to operate will expire. A company should retain this portion of cash and be ready to replenish them. The REITs and business trust have a habit of falling into #2. The outstanding businesses with high return on invested capital have a habit of falling into #1. 4. Company should pay off debts instead of satisfying investors thirst for dividend. Some companies know that investors like high yield, so they pay out and roll over debts or interests. They get into trouble when credit becomes difficult to get and they have problems refinancing, or have to refinance at a very expensive interest rate. This eventually becomes a burden on the share holders as they need to bail the company out or they get a much smaller dividend in the future. 5. Cash Flow from Business should be growing. Do not get suckered by one time large dividend payout. Analyzing the business nature and cash flow & income growth will tells us a bit or two on whether the cash flow in the future will grow. Analyse across 5 to 10 years of data. Do not use only one year because you may have just analyse a year where the business did exceptionally well. That kind of income will not be revisited always. The best is that there are visible figures showing good business model translating to consistent growing cash flows. The reason this has been a long article is that I wish to be more comprehensive about this. When you start looking at the cash flows of different companies, you will realize that sometimes certain cash flows do not present a good view. You tend to need to look at each of them to piece together the story of the company. Now take a look after the links below, I have a section on Actual Case Studies where I go through how I deduce some of these Free Cash Flow, Investors Cash Flow. We can only learn if we go through examples how we compute these cash flows. In this section I will highlight some of the past articles that I have talked about cash flows in detail. In this article, I try to see if HPHT’s investor’s cash flow can sustain its dividend. HPHT is unique in that some analysts project their future capital expenditure to be lower, the management indicated they will pay off some 1 bil in debts every year. So how much cash flow will they have? [Quote]A good example is SPH. I don’t know how you calculate free cashflow by taking away the cashflow from property investments. But I am curious that You put SPH free cashflow is consistently negative. SPH cashflow from operating activities is after dividend payment. That mean dividend payment need to add back to get REAL operating cashflow. 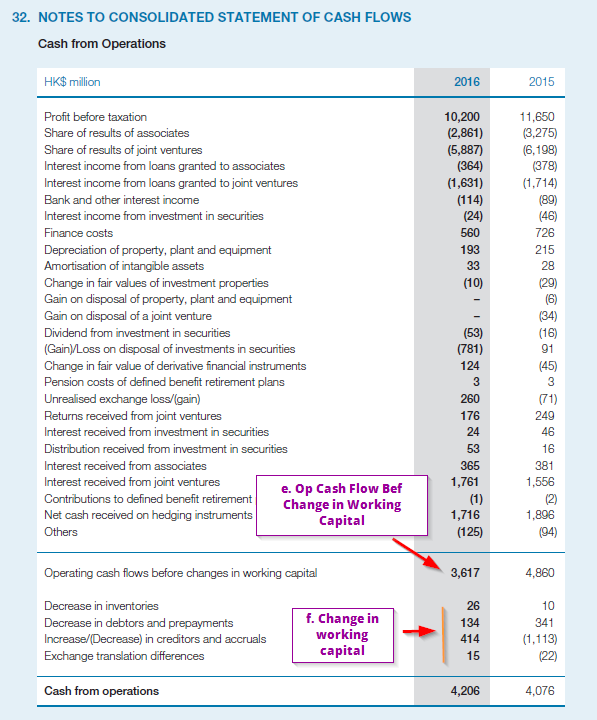 Since SPH dividend payments range from 195M to 433M, what I see is consistently POSITIVE operating cashflow. Yes that include FY2009. Of course, CAPEX(new or maintanence) must be deducted to get free cashflow and for SPH case, whether SPH is using investment gains/incomes to finance CAPEX or otherwise, SPH is consistently generating cash from investment activities. Which mean it doesn’t matter how one count them, SPH is generating free cashflow consistently. So I do not agree with your analysis and why don’t you put down the number and lets see why the diff. I was thinking if we could compare FCF/share or OCF/share with Div/share for a quick gauge if the dividend payout is sustainable. Hi James, using a FCF/share vs Div/share gauge looks good. but keep in mind to watch what makes up the capital expenditure and whether they are rebuilding the loss depreciation. I think the operating cash flow should not be $696.2 million as there is no deduction of taxes. Correct me if I am wrong as I am still new to the concept. May I know how did you arrive at the amount of $525 million? For REITs, if we would like to calculate the Cash management value, what makes up Maintenance Capex? do i just take into account purchase of plant and equip or do i have to take into account the other two too? i seek your advice in this. Here is how i treat maintenance capex. Purely based on how you can polish up existing equipment or replacing them so that you can be an ongoing entity. It may be different for much business but usually i would take purchase of plant and equipment. Having said that, I will urge readers to exercise practical evaluation specific to different business. If a company is unique in that the always need to purchase something under a different line item every year so that they can produce at the same level, then that should be included as well. thanks for your clarification on this matter. With regards to the business of REITs, would you then include CAPEX on investment properties in maintenance capex? It has been a recurring line item in their cash flow statements. The reason for this question is that when i include Capex on Investment Properties into the calculation of Maintenance Capex, i usually arrive at cash management value that is lower than the dividends issued. i’m a novice investor and have recently become a big fan of your blog. you’re providing a great service to novice investors like myself and i hope you’ll keep up the good work. i was running through the equations above and noticed that in the formula for operating cash flow, the tax expense was subtracted from net profit. wondering if it should be added to net profit instead, like in the formula for EBITDA. hi Mikhail, that part should be correct. the difference between ebitda and operating cash flow is that ebitda only contains gross profit before depreciation and all those stuff taken out. so basically it is the cash flow at its most virgin. I think I won’t be doing one for reits as what they use is actually funds from operation which is actually free cash flow. I enjoy reading your blog, please continue to blog and keep up your good work. Would you be able to extend the working copy (in excel format) of your singapore dividend stock tracker to me? Thanks and look forward to your favourable reply. Unfortunately i dont have an excel copy of it. Hi kyith, what format is your working copy? I coded it. its a custom format. Hi drizzt, I was analysing this stock called neo group limited. All the fundamentals looks good with CAGR 50%. However, there was one part which I realised that FCF was negative but they still gave out dividends and even increased the payout ratio. This company was listed only in 2012 but is fast growing. What do you think of it? Why would it have a negative FCF and still be able to pay out dividend? is it something very important which I should look out for before investing? certain businesses have really fluctuating working capital. your decision will be, does it have so many good points that i can live with that? if you can live with that, make sure next year it recovers this cash flow. dividends are paid with cash pile and debt. its not the right way but if the business continues to grow it may eventually covers it. the big caveat is that what if for a few years the fcf continues to be this bad? a lot of if and questions. thats how active investing is. Interesting article! It has helped me a lot in understanding cash flows! Can I ask you in order to calculate the FCF for CMHP, do I need to take into account “Acquisition of subsidiaries” and “Proceeds from disposal of jointly controlled entities”? I am trying to calculate the FCF yield here. Hi Casey, its good that you are trying to practice, but its bad you chose a complex one haha! You do not have to include the 2 mentioned, but on the positive ones you need to include from the investing section, dividends from subsidiaries, subsidy income. 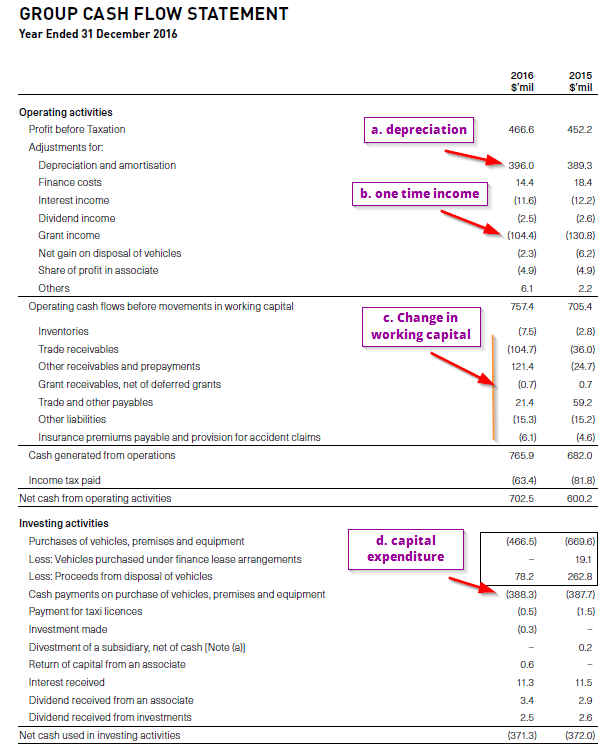 the negatives do include the capex in the investing section, but also from the financing section, the dividends to minority shareholders (for the 49% of YTW) as negative, interest expense as negative. Thanks for the swift response! I thought I should master the complex one to have a more accurate picture hahah. Sorry I’m still very much a newbie haha. Thanks for your help and enlightenment! Proceeds from disposal of property, plant and equipment should not be added. You should be adding this in: Repayment of loans by joint ventures in the investing. you should not count the dividends paid out to yourself in the fcf. that is the end result. the fcf eventually is to reinvest in biz, pay out the divd to yourself, pay down debt. Hmm.. so it would be deducting “Repayment of loans by joint ventures in the investing” and “Non-controlling interests of a subsidiary” am I right? Can I ask why is repayment of loans by join ventures necessary to be added to the free cash flow? Thanks again for writing this Kyith, I know it’s an older article but I find myself coming back to review it quite often lately now that I’ve begun to do more in-depth analyses of company cash flows. hi J, no problem. I been thinking of touching up this article to make it easier. do let me know if there are some questions that i can bring more perspective to readers that are new to this. Why the operating cash flow does not include the interest paid? Based on my understanding it is 647228 – 107134 (income tax paid) = 540094. Hi TY, the nuances of cash flow depends a fair bit on how the company classifies some things. Normally the interest expense are added back to derive the net operating cash flow. the interest expense is then deducted in the financing cash flow. btw your figures don’t seem to coincide with the figures put out.which section are you talking about. I would like to seek your advice on the following matter as I have no accounting background. In the cash flow statement, does the net cash provided by operating activities include the cash generated by subsidiaries? If yes, how I am going to know how much cash flow provided by operating activities are attributed to the equity holders of the company and how much attributed to the non-controlling interests. Hi Sam, it will depend on how much ownership the company have. Usually if a company owns 51% or more of the subsidiary, the profits, debts, assets are accounted 100% in the company. it becomes a nightmare stripping out the portion that is attributable to the minority shareholders (that is not yours if you own this company). this would be reflected in the net operating cash flow. if this subsidiary is listed, you can see what is the full profit and then minus this 49% of cash flow from your company cash flow, but its not very clean. if its a joint venture or associate in which the ownership is less than 50%, usually at the operating cash flow they will deduct the share of profits from these joint ventures and associates. By using SPH 2011 annual report page 94 as an example, the net cash from operating activities was $111,704. This $111,704 has also included all the net cash from operating activities provided by subsidiaries. Therefore the cash flow belongs to the minority shareholders (those who own the subsidiaries that is not owned by SPH) are not stripped off from the $111,704. Please correct me if I am wrong. Thanks. Am I right to say that if a holding company is deriving bulk of its earning from multiple unlisted subsidiaries, then this will be very difficult for us to analyse how much cash generated from operating activities belongs to the equity holder of the company and how much belongs to the minority shareholders. Hi Sam, from the SPH financial statements pointed out, there don’t seem to be a subsidiary that is less than 100% owned but substantial enough that SPH have to pa the non controlling investors. can you cite a better example because i am not sure what you are getting at. why do we need to split out analyzing the subsidiary to such an extent? Hi Kyith, the reason why I am asking how could I strip off the free cash flow attributed to the non-controlling interests is because of I want to make a comparison between the total profit attributed to the equity holder of the company against the cash flow provided by operating activities attributed to the equity holder of the company. By looking at the cash flow statement, the total profit transferred from the income statement has included the profit attributed to the non-controlling interests. As such I am not able to compare the cash flow provided by operating activities attributed to the equity holder of the company against the total profit attributed to the equity holder of the company. I am doing the above to see what is the difference in between the reported earning attributed to the equity holder of the company against the cash flow provided by operating activities attributed to the equity holder of the company. Normally, i would not cross check the income and cash flow whether it adds up. The reason is that to me its a futile exercise. Although 100% of the subsidiary profits will be accounted in the company, the cash flow might be wholly different. They might just pay back in terms of dividends that is in a different quantity. hence i usually evaluate for my own purpose, whether its free cash flow. Hi, would like to say a big thank you for this site which has a wealth of information. Hi mlee, the first part perhaps you can help quote which phrases that you are referring to. That would help an old man like me a fair bit. #2 different valuation metrics uses different forms of cash flow or equivalent. for example PE uses earnings, or net income or EBIT. EV/EBITDA uses EBITDA. price to free cash flow uses free cash flow. If you are using earnings then it is found in the income statement and not the cash flow statement. My point here is that the cash flow can be/needs to be calculated in different sections. But my main point is: do not look at just one year worth of cash flow. Appreciate a longer historical cash flow to understand its nature..
1) My simple understanding: Cash Flow in very simple terms is what goes in and out of a company for the period. e.g. We can look at the Cash Flow Statement item: Cash and cash equivalents. The difference from year to year is the Cash Flow. – Hence your graph refers to Cash Flow in total correct ? PE -> Earnings/Income is use so trying to understanding your statement in the graph of how Cash Flow is used in PE valuation. Hi mlee, thanks for explaining. I am explaining in general and using the graph to show how volatile the cash flow is. If we are talking about PE, then what is in the graph is the earnings, if its EV/EBITDA, what is in the graph is the EBITDA.